Your tools are your most valuable asset. They are what make doing your job possible. Effective tool maintenance is the key to making those tools last and protecting your investment. Most tool maintenance practices are very simple, easy habits that you can apply on a daily basis. Overworking a tool puts a lot of stress on its motor and can cause it to overheat. This mostly happens when you are trying to work through a difficult material, like drilling into concrete or sawing a very hard wood. Overheating can also occur if you run a tool too long without stopping. If your tool seems like it is getting hot, stop what you are doing and give it a break until it can cool down. This will help save you from wearing out the motor or burning out parts. For your best tool maintenance, power tools should be cleaned at the end of every shift and before they are stored away for the night. You can wipe dirt and other particles from the outside casing with a good cleaning cloth. Compressed air is the best option to clean the particles from the tool’s vents; cleaning your tool’s exhaust vents with a brush could push the dirt farther into the tool and inadvertently cause more damage later on. Lubrication is a must to keep all the moving parts on your power tools working properly. Check the tool maintenance section of your owner’s manual and follow the manufacturer’s instructions on how to correctly lubricate your particular tool’s model and which lubricant to use. Keeping your tool well-lubed keeps the parts from chafing, heating and corroding. Power tools are precision instruments. They use a lot of moving parts that need to remain in alignment. The tool maintenance schedule in your user’s manual will outline when a tool should be recalibrated, usually after a specified amount of use hours. Most tool companies offer calibration services for their products. Power tools need to be stored in a dry, clean place. 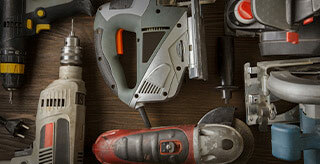 Storing power tools in a moist environment can lead to problems with the electrical components and cause corrosion. This can cause safety issues or cause your tool to stop working completely. Tools also should be stored inside a case or cabinet when not in use. This helps eliminate excess dust and particles getting into the tools through the vents when not in use. As your tool gets used, some parts will eventually need to be replaced. One of the most common replacements is the tool’s carbon brushes, which are responsible for conducting electricity through the motor. If your tool has a drive belt, like in a belt sander or some power saws, monitor it for wear and replace worn drive belts before they snap. Power cords and switch assemblies are also parts that tend to become damaged over time and are known for needing replacements. Lithium ion batteries are the current standard for power tools. One of the most important factors to keeping your lithium ion battery well maintained is to manage heat. Allowing a battery to overheat can fry it beyond repair. Store your batteries in a climate controlled area, and avoid leaving it in places where the temperature spikes (such as in the back of an enclosed truck). Do not let the battery run completely down before recharging it.